Dell has revealed new slimmed down Inspiron laptops with improved battery life thanks to the inclusion of Intel's fourth generation Haswell processor. The company describes its Inspiron 7000 Series laptops, which come in 14-, 15- and 17-inch sizes, as its 'thinnest and strongest' Inspiron line ever. 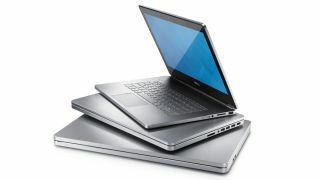 They're being offered with an Intel Core i5 or i7 CPU and optional SSD drive (in the Inspiron 15 and Inspiron 17). Dell says the laptops will provide almost nine hours of battery life before giving up the ghost. The 14- and 15-inch models can be fitted with an optional full HD touchscreen that offers 160-degree viewing angles, 10-finger touch and tough durability due to being constructed of Corning's Gorilla Glass NBT. There's a smaller Inspiron laptop on the way too in the form of the Inspiron 11 3000 Series, which features an 11.6-inch display with 10-finger touc that measures 21.2mm thick and weighs 3.15 pounds. Last but not least, Dell has introduced the Inspiron 23, an all-in-one PC with a "razor thin" design that totes 10-point touchscreen for interacting with Windows 8. Dell's Inspiron 7000 Series laptops start at £519 (US$830) for the Inspiron 15, rising to £760 (US$1,125) for the Inspiron 17. Both will be available from 26 September. The Inspiron 23 will be available to buy from Dell's website from 31 October, with pricing to be revealed over the "coming weeks".